Your voyage starts with a stop at Hydra. Located to the east of the Peloponnese, Hydra is an island without cars which offers a rugged charm and some spectacular scenes. This port of call will allow you to enjoy a leisurely walk through Hydra's little alleys and impressive stone houses. Lipari is the capital of the Aeolian volcanic archipelago and is particularly known for its many natural and architectural gems. Not far from there, discover the amazing sight of the Stromboli volcano, an active volcano whose crater regularly erupts with lava flows. Before returning to the aptly-named Isle of Beauty, visit Amalfi and its coastline. Perched between sky and sea, Amalfi and the little villages hidden nearby are true treasures and UNESCO World Heritage Sites. The Greek capital city is located on the edge of the Saronic Gulf, in the east of the country. It bears a plural name in reference to the first villages that surround the Acropolis. Be enchanted by the rocky plateau presided by its monuments listed as UNESCO World Heritage. In the city below, you can visit some of the liveliest districts in Athens: Plaka, with its maze of colorful streets, and where, in the evenings the drifting aroma of moussaka and garlic prawns will tickle your taste buds. Don’t miss anything of the city’s cultural past. Pay a visit to the National Archaeological Museum, or the Cycladic Art Museum. This unusual gem belonging to the Saronic islands is located to the east of the Peloponnese. There are no cars here. Named after the island, the harbor town is layered up the slopes of a mountainous bay. You may be surprised to see beautiful stone mansions. These are traditional here, as are the multi-colored caïques along the quays. Further along the shore, within the walls of the “Monastery of the Assumption of the Virgin Mary” is a museum of Byzantine art. Collections from Athens National History Museum are exhibited in the elegant villa Koundouriotis. 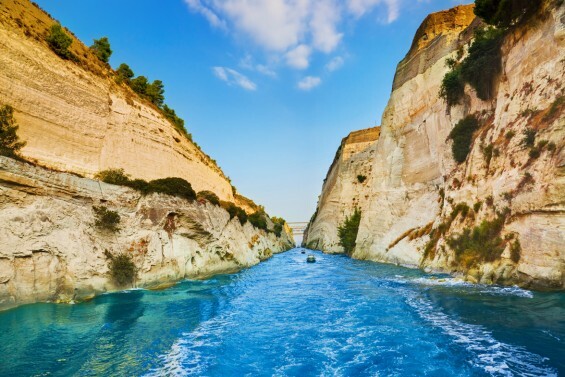 The Corinth Canal cuts through the Isthmus of Corinth, turning the Peloponnese into an island as it separates the region from the Greek mainland. Inaugurated in 1893, the canal is a little over six kilometers long and enables merchant vessels and passenger to avoid a long 400-km detour around the peninsula. The two sides of the canal reach a height of approximately fifty meters. From the exterior decks, don’t miss this unique opportunity to watch the ship as it navigates along the narrow strip of water encased between tall, ochre cliffs. What an experience! Be won over by the charm of this fishing village located north-east of the island of Cephalonia. 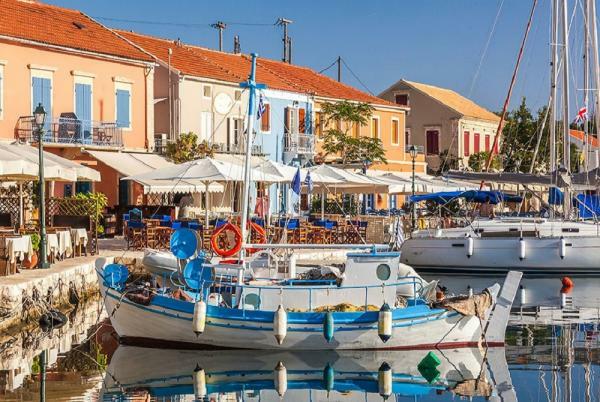 A best kept secret of the Ionian archipelago, Fiskardo gives onto the coasts of Ithaca, home of legendary king Odysseus. To see the coasts, just walk out onto the jetty. While you’re there, look back at the colorful houses along the quaysides: they have surprising architecture with evidence of Italian influence. Unwind at the café terraces along the water’s edge, in the shade of gazebos. While you watch the boats in the harbor, you can savor some local specialities like kreatopita, small meat pastries. 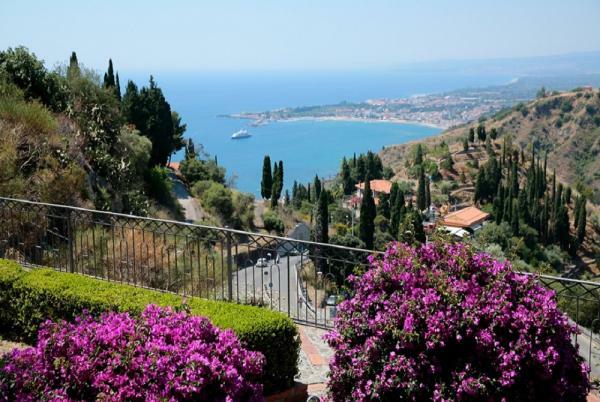 Located on Sicily’s eastern coast, in the province of Messina, the seaside town of Taormina is Sicily’s Saint-Tropez, boasting heritage sites, secluded beaches and luxury shopping. You can visit its medieval center, suspended 300 meters above sea level, where terraces offer a spectacular view of the Mediterranean Sea. Another vestige from its past are the ruins of the Greco-Roman theatre. This extremely well-preserved site attracts visitors who are fascinated by the natural beauty of the area which overlooks a turquoise bay. Like Ulysses during his Odyssey, have the opportunity to admire the Stromboli, the capricious volcano that looms over the Aeolian Islands. Its activity, uninterrupted for thousands of years, has earned it the nickname the “Lighthouse of the Mediterranean”. Of the seven Aeolian islands, this is the largest and the most populated. Lying off the north coast of Sicily, in the Tyrrhenian Sea, Lipari is one of UNESCO’s marvelous World Heritage sites. Its lava stone quarries and obsidian flow of Rocce Rosse are indications of its volcanic nature. The town, the largest urban area in the whole archipelago, proudly houses its citadel and its castle, both rooted in Antiquity. If you head further into the center, be surprised to come across a Norman cathedral, complete with a magnificent baroque façade. Nicknamed the “Blue Isle”, Capri is the most romantic of islands with many beautiful nature sites to explore, including the famous Faraglioni rocks and surreal blue caves. Perched on the hills inland the Villa San Michele and museum in picturesque Anacapri open their doors for you and offer a breathtaking panoramic view. 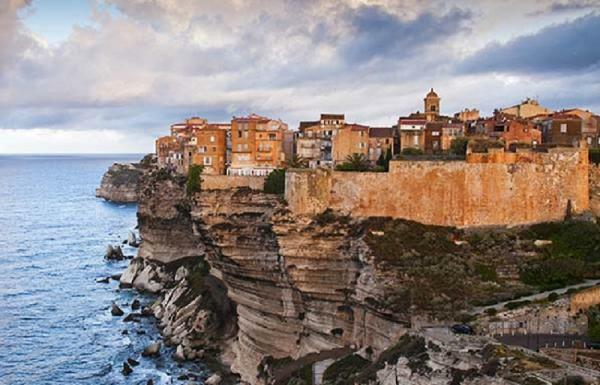 The spectacular town of Bonifacio located on the very tip of southern Corsica clings to a narrow promontory of white rock overhanging the turquoise waters of the Mediterranean. You can admire its limestone cliffs hewn out by the wind, before setting off on a cultural tour of its cultural treasures. From the little paved streets in the ancient Haute Ville to the promenade on the open-air medieval chemin de ronde, this stunning town takes you on a journey back in time. Frequented or secluded, there are numerous beaches to choose from, all in keeping with the high standards of the “Île de Beauté”. 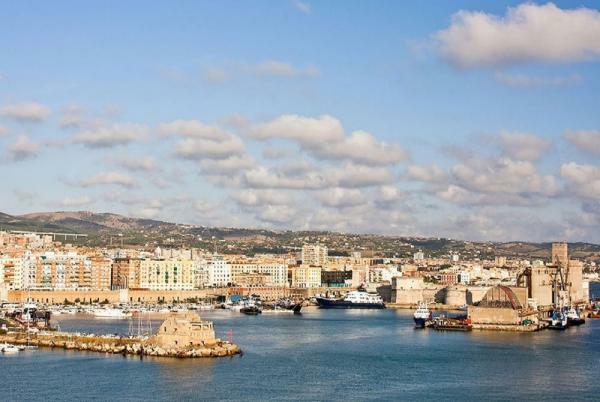 Built on an Etruscan site, between the Tyrrhenian sea and the Monti della Tolfa, Civitavecchia respires the dolce vita. This very modern and easy going town combines art and history with panache. You can also visit superb historical sites like Fort Michelangelo or the Cathedral of Saint Francis of Assisi. Just 80 kilometers from Rome, the town is a beautiful first step to the Italian capital. Individually-controlled A/C, en suite shower, desk, Wi-Fi access, TV, and stereo. 28 cabins, 200 sq. ft. + 43 sq. ft. balcony located on Deck 3. Individually-controlled A/C, en suite shower, desk, Wi-Fi access, TV, and stereo. 35 cabins, 200 sq. ft. + 43 sq. ft. private balcony. Individually-controlled A/C, en suite shower, Wi-Fi access, TV, and stereo. 37 cabins, 200 sq. ft. + 43 sq. ft. private balcony. Individually-controlled A/C, en suite shower, Wi-Fi access, TV, and stereo. 1 cabin, 200 sq. ft. + 43 sq. ft. private balcony. Individually-controlled A/C, en suite shower, Wi-Fi access, TV, and stereo. 3 cabins on Deck 6, 290 sq. ft. + 54 sq. ft. private balcony. Individually-controlled A/C, en suite shower, sofa, armchair and pedestal table, Wi-Fi access, TV, and stereo. 11 cabins, 398 sq. ft + 86 sq. ft. private balcony. Individually controlled A/C, ensuite bathroom with shower, desk, sofa, armchair & table, 2 TVs, stereo, Satellite telephone, Wi-Fi access. 8 cabins, 398 sq. ft + 86 sq. ft. private balcony. Individually controlled A/C, ensuite bathroom with shower, desk, sofa, armchair & table, 2 TVs, stereo, Satellite telephone, Wi-Fi access. 1 cabin, 484 sq. ft. + 96 sq. ft. private balcony. Individually controlled A/C, ensuite bathroom with jacuzzi and shower, desk, TV, stereo, Satellite telephone, Wi-Fi access. 7 cabins, 398 sq. ft. + 86 sq. ft. private balcony. Individually controlled A/C, ensuite bathroom with bathtub and shower, desk, minibar, TV, stereo, Satellite telephone, Wi-Fi access. On Deck 6, 592 sq. ft. + 129 sq. ft. private balcony. Individually controlled A/C, ensuite bathroom with jacuzzi and shower, desk, sofa, table with 4 chairs, armchair and table, 2 televisions, stereo, Satellite telephone, Wi-Fi access. • Any ground services before and/or after the cruise other than the ones mentioned in each “Cruise, Flights & Transfers” package and for which details are available upon request.